Historical precedence suggests Rabat and Washington are bound to be on the same team in the Sahara dossier. 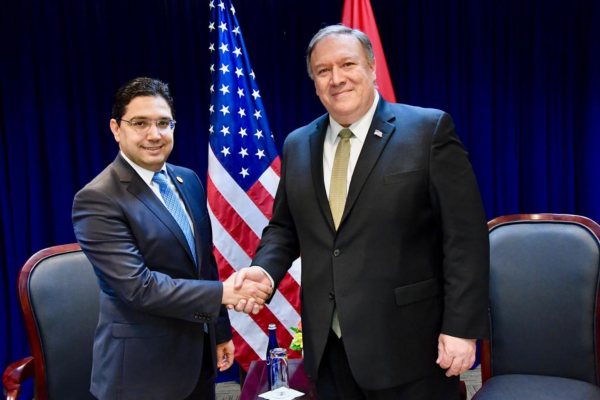 Morocco's foreign minister, Nasser Bourita, and the US Secretary of State, Mike Pompeo during at the Global Coalition meeting in Washington, D.C.
Rabat – A declassified document has revealed that Morocco’s proposal for a mutually acceptable settlement in Western Sahara was an American initiative in the first place. The US has been a staunch Moroccan ally on Western Sahara and plans to remain so even as it seeks to navigate the complexities of the conflict in Western Sahara, the document suggests. 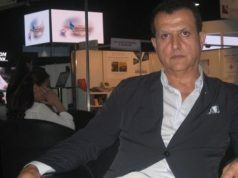 Titled “Sahara Policy History,” the seven-page document, which appears to have been written by the former Moroccan ambassador to Washington, Aziz Mekouar, shed light on previously unknown US support for Morocco’s Western Sahara claims. Morocco’s position in Western Sahara has in the last decade insisted that only through a “realistic” and “feasible” compromise-based solution can the Sahara dispute be brought to an end. Rabat laid that principle out in a 2007 document that has come to be known as the “Autonomy Plan.” The idea is to advance local Sahrawi autonomy under Moroccan sovereignty. But according to the declassified document, the plan was conceived at the US’ request. After that straightforward revelation in the introduction, the document provided a full roadmap of the events and people that contributed to the writing and adoption of Morocco’s Autonomy Plan. When the UN brokered a ceasefire between the Polisario Front and Morocco in 1991, the initial move was to station a peacekeeping mission—MINURSO—in the disputed territories until the conflicting parties could reach an agreement on referendum. By 1998, however, a series of failed attempts to prepare the ground for the promised referendum prompted stakeholders to realize it was a doomed idea because of fundamental disagreements between Morocco and Polisario over who should be allowed to vote. Faced with a political and procedural stalemate, the US State Department took the initiative in December 1998 to produce a “policy review” on how to best end the diplomatic gridlock. The review, which saw the contribution of the US ambassador in Rabat, Edward Gabriel, and the embassy’s political counselor, Bob Holley, concluded that the referendum option was a “dead end,” according to the declassified document. Important in the move was the idea that the negotiated solution would be based on “continued Moroccan sovereignty in the Sahara, but with the granting of a broad and substantial (by international standards) autonomy for the territory,” according to the declassified document. Even as the Clinton administration presented its conclusions to King Hassan II, convincing him of the viability of the “broad autonomy” option in contrast to the impossibility of a referendum, the Moroccan monarch did not immediately approve of the move. “He lacked confidence that Algeria would be prepared to bargain in good faith on such a compromise – nor was it clear that he had much confidence in the willingness or ability of the United States to become a full partner in bringing Algeria to this point of view,” the document said of the King’s initial skepticism. By July 1999, the King, having apparently reached an agreement with Algeria’s newly emerging strong man, Abdelaziz Bouteflika, that “a solution along the lines of the American proposal was now possible,” the Moroccan monarch finally agreed to the proposal. But he died three days after agreeing to the proposal. King Mohammed VI, who replaced his father in 1999, was quickly briefed on the pending proposal. After the new King green-lighted the plan, the next move was to associate the UN mission in Western Sahara with what the US believed was the most effective way of ending the longstanding dispute in Western Sahara. Senior American diplomats subsequently briefed James Baker, who was then the UN Secretary-General’s personal envoy for Western Sahara. In 2001, Baker proposed a settlement plan known as “the Framework Agreement,” consistent with the US-inspired autonomy plan and hours of behind-the-door negotiations with Moroccan diplomats. 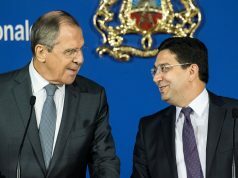 Morocco accepted Baker’s proposal, but Algeria and Polisario vehemently opposed it. The plan brought back the referendum option to the table. But Morocco, taken aback by the sudden change in Baker’s move, categorically rejected the “Peace Plan.” However, because of “Baker’s great prestige both in New York and in Washington, there was considerable confusion as to whether he spoke for himself only, or for the new Administration,” the declassified document noted. Those doubts ended in September 2003 after King Mohammed VI met with US President George Bush. President Bush told the King that Baker was not a US official, implying that the UN official’s actions on the Sahara question had nothing to do with the official US position. Bush promised the King that his administration would commit to the action plan Morocco had agreed to with the Clinton administration, urging the King to go ahead and put together the autonomy plan. Seeing that the US was siding with Rabat, Baker resigned from his UN position. While many of the events highlighted in the declassified document were already public knowledge, the information that Washington was the originator comes at a politically-charged time as the UN pushes for a sustainable settlement to the dispute. In line with the latest UN move to revert back to supporting Morocco after months of wavering commitment, the news of the US requesting the autonomy proposal is bound to ditch many speculations that have surrounded the international politicking in Western Sahara. Meanwhile, the declassified document suggested that Morocco continues to wait for the day when the US will publically reiterate its support for Morocco’s Western Sahara claims. But the news of the US helping in the entire process of what has become Morocco’s trademark on the Sahara dossier is also set to comfort Morocco in its growing confidence that only its position will stand the test of realism and political pragmatism. 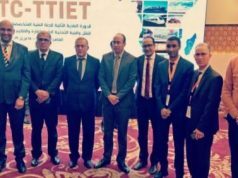 Morocco is already convinced that its proposal is more feasible and more in line with UN requirements than Polisario’s position is. With the unpredictability that has fraught the Trump administration, however, it remains to be seen whether the current, or the subsequent, US administration will provide Morocco with what other US administrations simply flirted with: Disclosed and full support for Morocco’s Western Sahara position.